HydroProof is the easiest, most advanced system for the hydrostatic testing of individual tube-to-tubesheet joints for boilers and air heaters. Using water under pressure, this lightweight and durable tool can hydro test up to 2,000 psi for tube sizes from 1" to 2.5" O.D. With the addition of the new, Full Tube Length HydroProof, it is now possible to test the integrity of a tube along its entire length, with the same ease of use and setup offered by the standard HydroProof. For determining correct expansion procedures and periodic testing of expansion quality, the HydroProof is an essential part of any successful job. Lightweight: 5.5 lbs for a 2" tool. For use on both curved drums and headers or flat tubesheets. Available for all 1", 2.5", 2", and 2.5" O.D. tube sizes. Hydro test to 2,000 psi. Setup takes less than one minute by only one operator. Correctly determine initial expansion procedures from the start by establishing that the first joint is leak free. Periodic testing of expansion quality during fabrication or a re-tube. 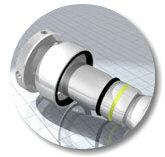 Ideal for partial tube replacement - Guarantees leak free joints prior to a full hydro test. Reduce the number of complete hydro tests required on any job. Full length tube testing fixtures available. Using the new Full Tube Length variant of the HydroProof, it is now possible to test the integrity of a tube along its entire length. A mandrel is inserted at either end of the tube, one for water-in, the other for water-out.